Hamiltons Boutique Aerial Fitness Studio. Located in the heart of Hamiltons CBD, we offer Pole dance, Antigravity Aerial Yoga classes as well as Aerial Hoop. This is more than just a work out class! This is where you will learn to take your body to a new and stronger place. Join us for what is always guaranteed to be the best part of your day. Whether you have no fitness or dance experience or you are a professional athlete we will have a class suited to you. Pole fitness classes are one of the most fun ways to get fit. Drawing on a combination of dance, gymnastics, yoga and Pilate style exercises. 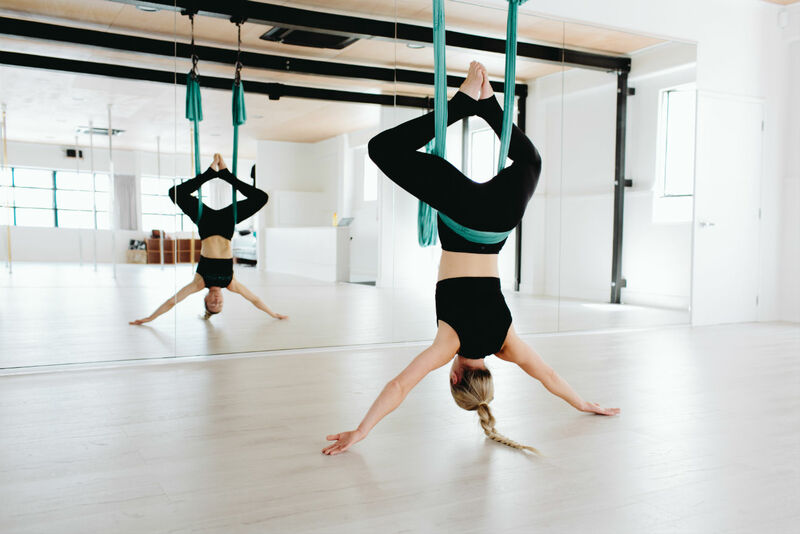 Aerial yoga involves using a waist height hammock to perform a series of exercises. We guarantee yoga is even better with your feet off the ground. Aerial Hoop is a circus apparatus on which acrobatic tricks are preformed while suspended above the ground. Incorporating spins, beautifully flowing pose and daredevil drops. HIGH ABOVE offers supplementary classes and training options. From studio practice sessions to flexibility classes and private one on one coaching. We only use equipment from the leading industry brands which have been load tested for their specific use - so you can trust you are in safe hands.